"This recipe is truly a family favorite. I don't know any one else that makes this. I think my father-in-law invented it. When people had little money they used whatever was at hand. My father used to say 'one will never starve if they have potatoes, onions, and a loaf of bread.' This is a typical peasant recipe that was made when times were not as affluent as they are today. Really good on a cold snowy day." Heat oil in a large pot over medium heat. Saute onions until translucent. To the onions add water, potatoes, salt and pepper. 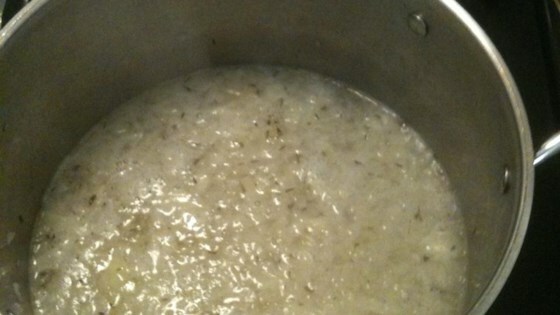 Bring to a boil; reduce heat to low and simmer for 20 minutes, or until potatoes are tender but still firm. Remove from heat and gently crack eggs into soup; be careful not to break eggs. Place on low heat until whites of eggs are cooked. Cool slightly before serving. This was a great recipe, I did add some chicken broth and soy sause, and it turned out great. Great recipe! Awesome! Hearty. The eggs give a unique flavor and texture.